Melody Homes apartment is located along Lebuhraya Thean Teik, Air Itam Penang, a new project by Belleview Group. Melody Homes comprising apartments with recreational and condo facilities. It is located conveniently within distance to well-known government school and public amenities. How much and when launch?? ?Wht is the build up? Is this completed? How much is it for sale?? * total of 500 over units. I am thinking of buying one but i am kind of worry on the accessibility. Any comments ? Irene, then you better stay in Kulim, no traffic jam! Cheap, cheap and big, big as your bullow cartwheel! If traffic jam everywhere why not take motorbike license now 1Govenment msia say that the fees as low as rm211 to sit for exem, roadtax rm2, insurances below rm 150 and petrol full tank rm6-7 can last for 1 week better than car. Do anyone know when is the launching for this project? It should be very soon. This project suppose to be launch around this month. Seems like they postpone it a bit. One thing i found out that the price they plan to sell is a bit expensive. irene, don't you worry, no one is selling you at 75k!! just out of curiosity, i wonder where you stay?? I have visited the show unit at 5th vantage tower beside jelutong CIMB bank. I think worth for stay cz nowsaday hard to find an apartment wf condo facilities and the starting price RM160k+ (depends which floor). Anyone who interested can visit the show unit. I just visited the show unit last weekend. The hall is really small. Just wonder this property is good for investment or staying purpose. Any advise? 1. The units is on draw lots basis. 2. There wont be any traffic light for Melody Homes resident because there is already one at BL Avenue. The unit is rather small but it may suitable for those young couple for their 1st house. It may also good for investment or rental purpose.I am really suprised that the unit is on draw lot basis, it is not low cost house, how come we have to pay such amount without selecting the unit by ourselves? Yes, this apartment is suit for small family. The layout is pretty attractive too. However, compared to BL Avenue, this apartment is a bit expensive. And yet,only 1 car park provided. The additional car park cost 18K. 1)The units is on draw lots basis because consider as low-medium cost. 2)I agree the additional car park cost 18k abit expensive. 3)The hall is small bcz the placement of dining table. I suggest u knock-down the wall near main door for 1~1.5ft so u can place the dining table nearby kitchen entrance and living room will be look fine. 4)About investing or staying, i think both also ok. According to my secrets, this unit wil launched on september 09. Now about 160k, after launching the price wil increase. I just know an apartment with full facilities and gd management will hv gd return. 5)If compare 700sqft with 700sqft apartment, i think this apartment layout quit nice. 6)Actually when we sign S&P that moment we wil sign another 30-40k reno contract(not so sure the amount) which hv include in 160k. If include partially reno then still worth. 7)If i'm not mistaken, the sink,basin,wc given totally same as the show unit type. Is good quality. Besides, door grill and bird nest also including in reno contract. Anyway I hope anyone who interest plz ask more detail from the sale girl or visit the show unit. ^^... Good luck!! Pertaining to your item 6. What do you mean by "when we sign S&P that moment, we will sign another 30-40k reno contract which hv included in 160k" ? Can you pls explain further. Thanks. Yeah...same here. I would like to know what is that? Does it mean that once the apartment is ready, it will be filled with 30-40k worth of renovation materials? 1) Regarding this issue => "when we sign S&P that moment, we will sign another 30-40k reno contract which hv included in 160k", I also heard from ppl . But i think he might misunderstanding. So am I. Sorry for that. Actually when we buy this unit for 5% down payment, wil receive few slip(partial 10% of stage 1, apt purchase price, upgrading package and carpark purchase price). So, the 30k+ not reno but is on upgrading package. Just comfirm the wc, basin and sink same as show unit(good quality). All tiling work is provided and so the electrical points. Anyway for those interest, pls refer to the person incharge(belleview sale person) for more details. Thx for ur feedback and sorry for misleading. hi everyone, this is my 1st step into property market.Can any 1 shares opinion on Melody Home, whether it is worth to buy? here's my thoughts, if you don't agree then forget it. 1.price at 700sq feet 159k and 745sq feet 175k. I think most of the penang property price also rise already. Additional car park also price at 18k, already sold out. Compare to the projects beside melody, the boulavard, the card park is price at 24k. So to me, still consider ok. I feel it's still suitable for husband+wife and a kid. Not that suitable for big family. 4. traffic is definitely bad in farlim. I think everybody would agree with me on this. I'm not sure how are they going to expand the road there or they don't even have a plan to do so. So get ready to face the congestions there. It might take u like 30 minutes in the morning to get from farlim to lorong batu lanchang. can anyone explain to me ?????? hw come d installment is different from ambank and eon bank. i hv submit my doc to ambank and eon bank.Both approve my margin of finance is 95% and tenure is 30yrs. A bit funny is installment for eon bank is RM656 and for ambank is RM670. i m using housing loan calculator from internet and hP also cant get the installment RM656 for 30yrs..
as i know that the installment for 30yrs s/B RM670.Hw come it will be RM656..really funny ler..is that any discrepancy happen ???? 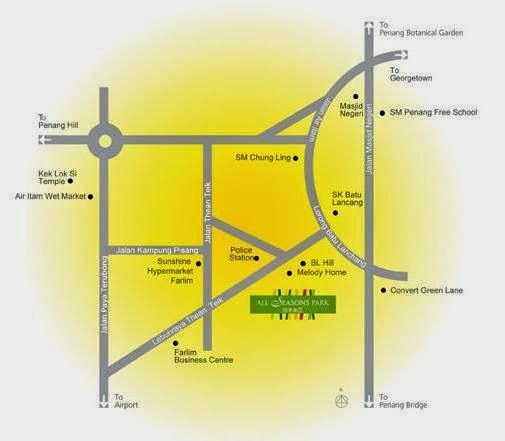 Dear all, in case you need a place fast and secured with OC and facilities, you can always consider Asia Heights apartment which is just 5 minutes drive away (behind Tower 3). It's 800 sq.ft. with cute balcony plus 2 acres roof-top garden. FREEHOLD. Price: 160k onwards. You will select which Aprt, depend your selection. This is early stage of community, we are towards to firm an official community for this freehold property, to ensure it`s in well-managed, quality living, clean, harmony and peaceful. Awesome Paulz..thanks for the great effort of coming up with such idea.. If want to dump for cash after 3 Years, which back will benefit to consumer (EON Bank or AM Bank ) ? How about your BLR rate and the offer ? Welcome everyone join Melody Homes pages at facebook. Belleview houses are not bad.The only bad thing is its staff are very "lan si"(arrogant). is there any show unit in the construction site? NC, I'm not sure whether there're any units left but i know that they have a show unit at the construction site, same place as the All Season showroom. Saw it when i visited the All Season showroom last week. Yes, some units at higher floor are still av. was told that they may increase the price sometime June or July. The units only up from 19th floor and the price is up from RM173900. 1.The Belleview package is end of june.Free S&P legal fee,10 % deposit and 100% complete start the loan(when take oc). 2.6th floor-18th floor is sold out. 3.S&P(SPA)& Loan Documentation must be prepared by developer's selected panel of lawyers. hope that still some of unit available when i visit. realli worth buying..i also bought a unit there at 173900!Property in penang going up everyday.So far, Melody Homes to me is the best offer i can get in the market. Cheers! Hi,anyone want to let out your parking lot at Melody Homes.I am interest thank you. I suggest everyone to join the group of Melody homes at facebook. Mel, which floor did u bought at RM 173,900.00? moneyooi1, i m oso one of MH buyer. I bought additional carpark and i oso decide to rent out?you unit which floor and what facing u took? Hai,Moneyooi.If not mistaken your CP s/b at Level 3 rite. My CP at Level 2 (indoor juz next to the lift) and another one at outdoor. For the time now i decide to rent out at RM 100 for indoor and RM 90.00 for outdoor but see the market price ltr. Money ooi, the extra CP will be accessory cp and cant sell seperately. haha, why a lot people have a sense and feel than Belleview stuff are "lan si"(arrogant)???? by giore Lee(the formerly community founder of Sri Kristal Apartment,Farlim). but recently we find out that a very young boy (around 15~17 years old, sirname: Ooi, and never show out his real person), who also found another community in facebook just for fun, this young boy did not have any experience(even under aged) and connected with related lawyer and accountant to assist residents to form an officially community under gov. housing act for your premises after O.C obtained. you can ignore this kind of fun community in facebook, if you are serious about join in a coming officially community. until now, how many % completion already ? have any photo to c? and when is the expected date of completion? I saw last unit sold at RM 273k corner unit. price raise is crazy..
Want To Buy, any available unit?or who wan to let go. need advice is this melody homes owner transferable? hear that i was 5 years stage consent? do you think when the developer will gain it? To answer your question, we have to wait 5 years before selling as this is registered as LMC with the government. This has nothing to do with developer but its a government ruling. 2) Option 2? I am not sure, can anyone advice here? Hi thanks for reply "Aurora" ..seem like there no others ways except 5yrs :( , then good luck to those who buy as investment. But i heard that harmony view also a LMC,having no problem buying or selling within 5 years,but need to handle by certain legal firm. Would appreciate some advice on this matter. Want to rent an additional car park, anyone would like to rent out his / her car park, please do let me know. Thanks!!! What is the valuation price now? How much is the current selling price? Is it transferable? What are the facilities? Any solid indication that there will be a future road behind this project and when will that be? How much is the maintenance fee + the monthly sinking fund? its around 300k now, have BBQ pit, swimming pool, landscape garden, 24 hrs security, playground, GYM and etc... its transferable... about the road bhind in future, tats im not sure... the maintenance fee + sinking funds below rm 130. Now onwards we'll see the property graph in Penang start coming down, supply over demand all ready unit almost empty, let's wait until next year or after GE13 for sure the property in Penang will coming down like "Hell". As we seen in Melaka state. Real estate bosses preparing to face coming 13/14 supply over demand but I was wondering those who had bought more than 5 unit at certain location ...are they worried or maybe they think they may just wait for 4/5 more years than they can sell at better price. Now as I can see places like tg tokong, tg bungah, batu ferringhi,Balik pulau,teluk kumbar,sg ara where vacant r more than occupied. Those which had almost 80-95% occupied r pulau tikus, gurney,bagan,Georgetown ,air itam,green lane,jelutong n bayan baru etc,..
my cousin just bought a unit, but lawyer say cannot transfer. you know what lawyer can do transfer? Please contact me at pink.fern.gallery@gmail.com for additional car park rental. Thank you. Do you know what lawyer can do the transfer? Does anyone knows how many block for this apartment and what is the block number? Hi All, the current selling for this project is RM350,000 per unit. what about corner unit how much issit now ? Anyone currently staying there(high floor tenant/owner), may I know what internet service provider you are using currently? Have checked few ISP(wireless mainly) but all have no coverage?? I have a unit at hand for sale. 700sf, original unit, unfurnished, facing swimming pool and not facing cemetry. Kindly contact via email pink.fern.gallery@gmail.com. Hi... Im a tenant in Melody Homes. Anyone interested in renting out their carpark for 3 months? From March till end of June. Can contact me: 0176770309 or email at enaerwina@yahoo.com thank you very much. - WE HV KEY !!!!! I'm looking for 1 car park lots. Any car park lot for rental? Kindly call 017-4911268 Nick. Hi, i have few units for sales and rent! Please call or Whatapps me, Joven Goh from Mansion Properties. 0164173556. I have 3 cheapest unit in market! Any owner are welcome to list! Thank you, have a nice day.